Happy Friday friends!! Did this week fly by for everyone? It was a whirlwind and I had every intention of sharing our holiday cards yesterday, but alas meetings and long days didn't allow for it!! I'm excited for this weekend - holiday parties, recitals and hopefully a little more shopping!! 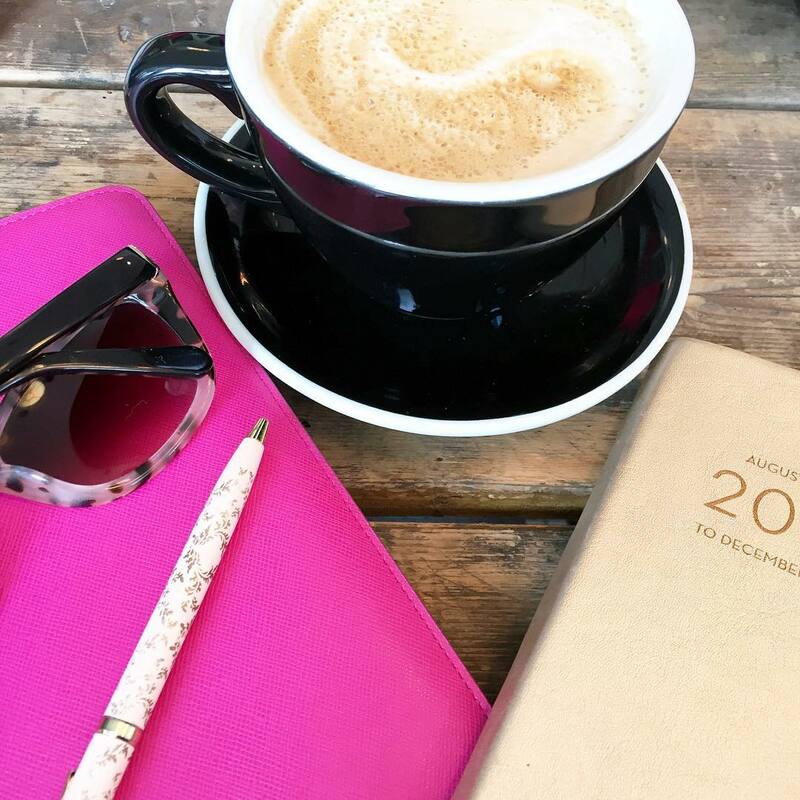 Here's a few things I loved this week! 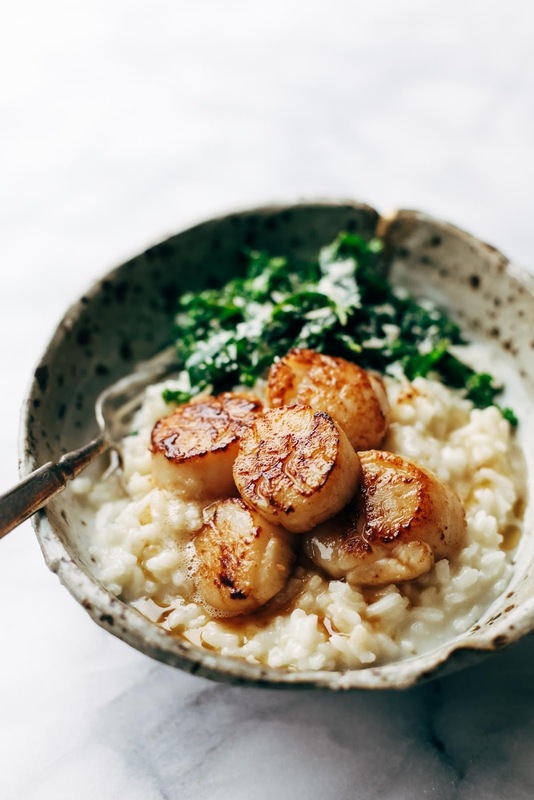 I must be on a seafood kick (which is always) because after sharing this recipe earlier this week, I stumbled upon this Brown Butter Scallops with Parmesan Risotto from Pinch of Yum and knew it would be incredible! I sometimes get a little scared to try some of the DIYs that I've pinned, but when something is as easy and cute as this one - I sort of have to give it a try! Would be a great gift for a co-worker or friend hosting a party! Pantone announced the TWO colors for 2016 and it's like a beautiful cotton candy sunset!! I personally can't get enough of Rose Quartz and can't wait to wear more pink! 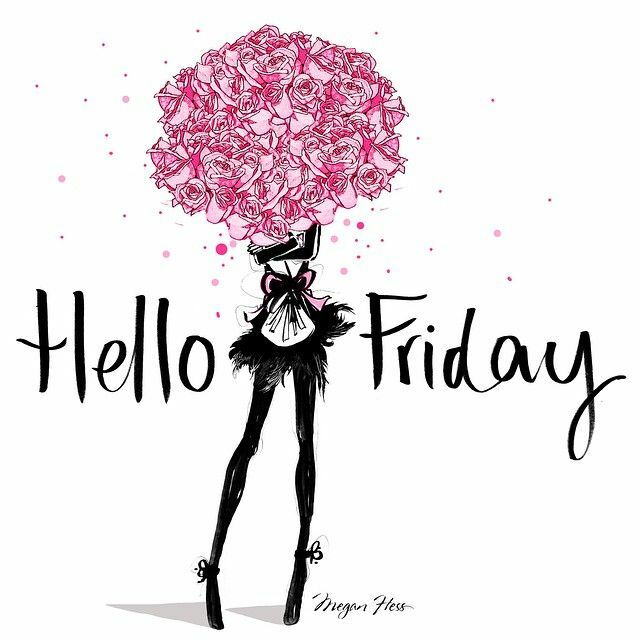 Happy Fri-YAY!!! Cotton candy sunset...oh you know I love me some cotton candy, pastels will be a nice change, I'm for it!! Macaroon LOVE!! Yet, alas, I still have never had one!!! Crazy. I hope this weekend is festive, happy and as sweet as you are!! Macaroon making class sounds amazing!!! Have fun! Love the Pantone colors of the year! We will just have to wear more pink! Haha great links at the bottom! Heading over to those! Happy Friday! You know I am thrilled about Patone's colors for 2016!! One can never have too much pink! Hope you have a wonderful weekend. I was so excited when they announced the color of the year! I adore that cotton candy pink! Have a wonderful Friday and awesome weekend!!! I am so excited about these Pantone colors! They are so soft and feminine! I need to check out the measurement guide! I have been severely off lately when it comes to online shopping! Have a great weekend! Oooo The Scallops and Risotto dish looks delicious!!! I'm so in love the Pantone colors this year!! I hope you have a great weekend! =) Good luck sending the holiday cards! I have that same recipe saved! It looks SO good!! I have been wanting that pink KitchenAid too--it's just so adorable! Those scallops look so darn delicious! Have a wonderful weekend! Hah this week was the complete opposite for me, it felt like a million years! So exciting you're checking something off your list, and making macarons will be so much fun!! Those scallops sound amazing! I'll have to try them! Oh wow! Those scallops look amazing!! The Parmesan risotto sounds so delicious too! Have a great weekend! Great pink minds think alike, lady! So excited for the two colors this year, I know they are gonna be gorgeous and romantic and fun, woohoo! The scallops look so delicious, I need some this weekend! can't wait to hear about your class, gimme all the MACAROONS! Rose quartz - yes! And that DIY is the cutest! Hope you have a fab weekend girlfriend! Yay for lists and Macaroon making sounds so fun!! I am IN LOVE with the new colors, I kinda like the fact that they couldn't pick just one. Good luck with your diy! I am also hopping on the rose quartz train stat! It's just such a gorgeous color! I don't have enough pink in my wardrobe, so I'm excited to add to my collection this year. OMG finally! I've been waiting for 'blush' to make a comeback! That just means I need to get the Kendra Scott earrings in Rose Quartz that I've been eyeing, have a great weekend! that recipe looks amazing! and i'm seriously dying over the rose quartz color - give it to me for all the things! you're right - it looks just like cotton candy :) have a wonderful weekend love!! I love love love the new Pantone colors! That blush pink is my jam! The Pantone colors are so pretty! Can't wait to hear about how the Macaroon class goes - good luck! That recipe looks delicious! I just pinned that one! Those Pantone colors are fabulous this year! Sometimes I am not the biggest fan of their choices but I really love the pink and blue. I cant wait to see your holiday card! I am so excited about those colors for next year and TWO?! Did they explain why they're doing two? Off to read the article now. Can't wait to hear about your baking class, I have that on my list, too. I hadn't heard about the new Pantone colors yet, but I'm OBSESSED!! Love both of them! And that scallops risotto recipe? Definitely will be trying ASAP. Happy Friday! Those colors are so pretty! Love the pink. That macaroon making class sounds like SO much fun too!!! I took a french baking class a few years ago and made them. They didn't come out like the pretty ones in your picture though lol. 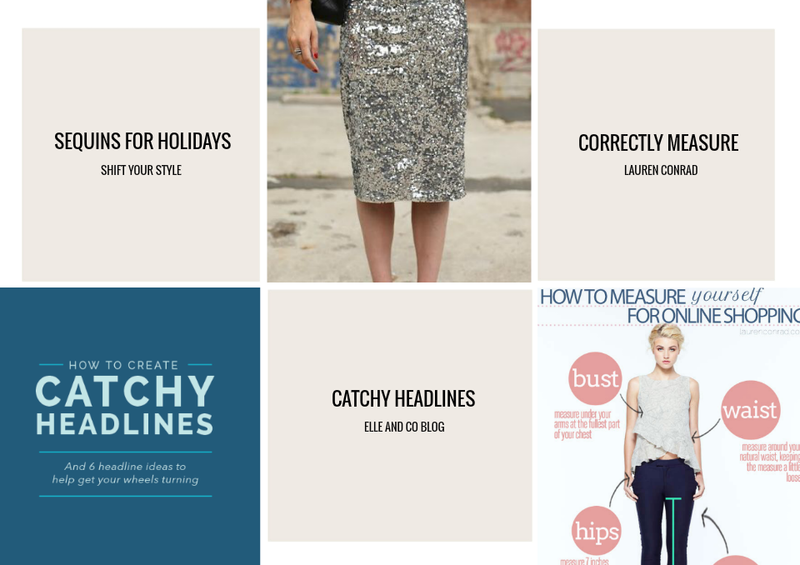 Yes to sequins for the holidays too!! Have a fab weekend! Those scallops look amazing! I haven't had seafood in so long & now I just learned that my boyfriend doesn't like seafood. Looks like I'll be making them for me & only me. Lol which could be a good thing because then I don't have to share. I have been really craving some risotto lately, that looks amazing! I love the link to all of the sequin outfits you shared... that to me is quintessential for the holidays. Gotta always have a little sparkle! Have a great weekend! The pantone color for 2016 is so beautiful! Happy Friday! Those scallops look delicious...the whole plate does! Yum! 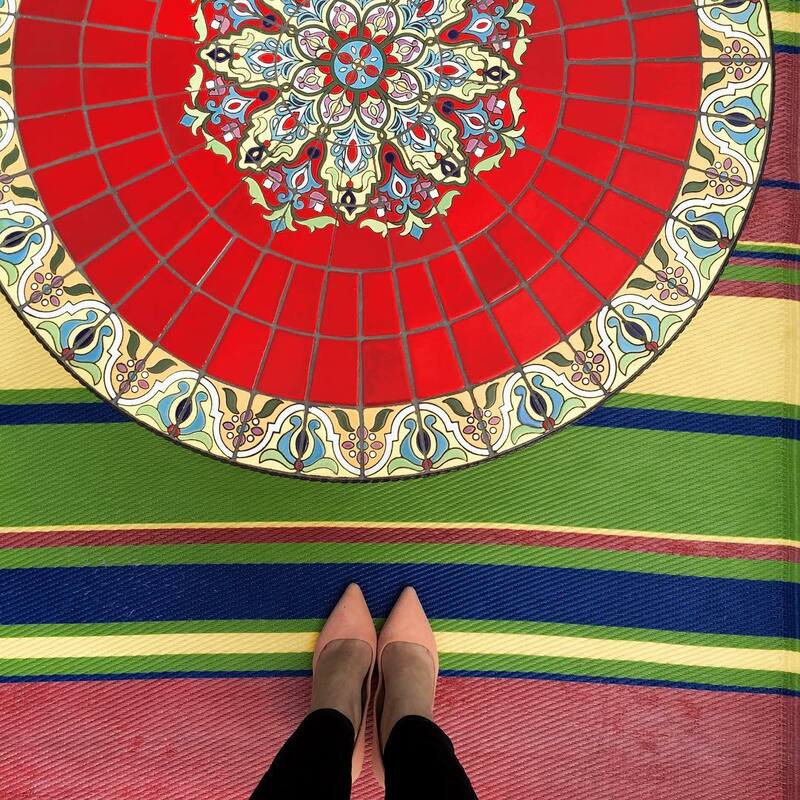 Pantone nailed it for 2016's colors! I LOVE them, especially Rose Quartz! I hope you have a lovely day and weekend ahead, beauty! 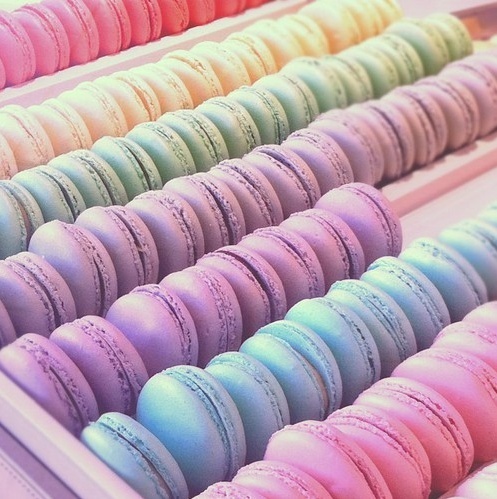 Oh girl macaroons are my weakness. Good luck making them! They seem difficult but I'm sure not as hard as it seems. And yes to the Pantone colors! 2016 is going to be a romantic year, haha! The scallops recipe sounds amazing! I've never attempted to make them myself. Have fun at your macaroon class...can't wait to hear how it turns out and what types you got to make. Happy Friday! Happy Friday! I love the 2016 colors of the year...they are so different than the past few years! I'm excited to see how the macarons turn out! Have a great weekend! I need to come to your house for dinner, you’ve always got the best seafood type meals! Love the look of that ornament. I’m heading to the craft store later and was thinking about possible throwing in some supplies to make a few of my own too, maybe! Love all the sequins! You are the person to go to for good seafood recipes. 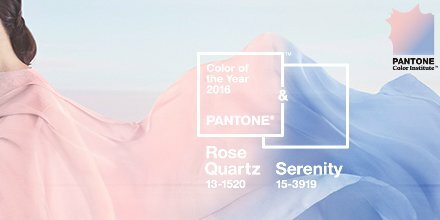 I love that Pantone chose two colors for 2016. They're both beautiful on their own, but combined they're just so soft and gorgeous and LOVE. I especially am grateful that I've been on a Rose Quartz binge and now there will be so many options of everything in that color. Bring it on! That ornament is just darling! And macarons are my favorite dessert and next on my to-make list. Glad I stumbled upon your blog; looking forward to reading more! I really like the color of the year!! I think th epinky shade is just too pretty. That scallop recipe sounds incredible...so many delicious flavors in one dish! I've been on a seafood kick lately so I'll be trying those scallops! Have a great weekend! Macarons are my life! I want them all now! Hmmm idk which sounds better. Zoodles or risotto? Both? Ok. (; haha. Seriously keep us updated on your baking class! I hear those are sooo difficult to make! Have a lovely weekend! The scallops dish looks delicious! I also love rose quartz! It's such a beautiful color! Have a great weekend, Biana! Also great links. Lauren Conrad always has such savvy advise! Have a fabulous weekend, friend! <3 Ada. I saw the color announcement yesterday and I got so excited for Rose Quartz!!! The blue is pretty too but I just adore pink. And I want an excuse to have a Kitchenaid Mixer as well!!! It is something I have on my coveted must have list. I think it is on my 40x40 list to own one LOL! How fun you are taking a macaroon class!!! I would love to do that!!! And a sushi class. Have a great weekend! 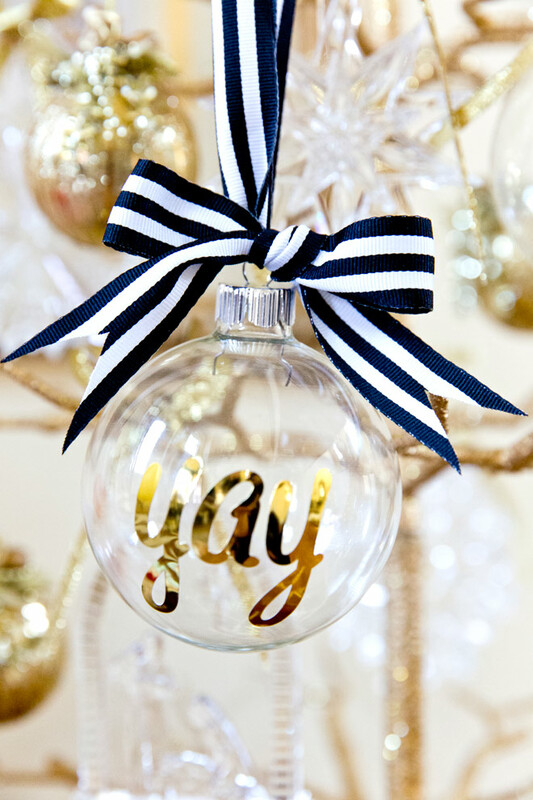 That DIY ornament is so pretty and seems somewhat simple enough to do! Loving those colors, perfect cotton candy sunset! Happy Friday! That ornament is super cute, I would totally try it! PS kudos to you for wanting to attempt baking macarons - I wouldn't even dare try! hehe they sure are pretty though! Ooooh I hadn't seen the colors of the year for 2016 announced. So pretty and so complementary, I love them! Two pantones are so exciting! Meanwhile I asked for a 2016 moleskine planner that's closer to the 2015 color! I have a red Kitchen Aid Mixer and love love love it! Those scallops....yum!!! I've never cooked scallops but I'd give it a shot. Have a great weekend, Biana! I love seafood and those scallops look so good! And that ornament does too - it would be the perfect gift! I'll have to check out the catchy headlines article. I struggle for sure. Happy weekend! I'm excited to hear about your macaron making class! Ohhhhhh I hadn't seen the Pantone colors yet but I'm loving them...beautiful separately, but they really work so well together! I already know from Snap what a crazy Friday you're having, yikes! I am so excited that you're taking that class, what a FAB idea!! Oh my gosh that scallops recipe-- Yum! Oh my goodness- a macaron making class?! That sounds amazing!! And that's awesome there are two colors- I'm all about the blush these days so pink for the win! Happy weekend, love! I am also excited about the new pantone colors. Kind of interesting that they are very pastel-like around winter time. I'm curious to see how they work them in to the winter lines. A macaroon baking class?! How fun! Please share your new knowledge after. :) I'm so happy that Rose Quartz is one of the colors for 2016, now I have an excuse to load up on pink. Have a great weekend! Seriously going to try that DIY! Thanks for sharing!!! You'll love the macaron class. I took one last year. They're really easy; they just take some time. Enjoy! I love macarons to death but I know I'd be too lazy to make them myself---I'll leave that to the professionals like you :P Also, that DIY bow ornament is cuter than some of the ones I see in stores! Hope the cooking class went well! I love doing things like that... Especially when the results are tasty goodness!! The KitchenAid mixer is a great tool for the kitchen if you bake a lot! I use mine very often. It's a little difficult to clean, but a huge helper! Can't wait to see your Christmas card, Biana! They're really easy; they just take some time. Enjoy! A macaron making class sounds like so much fun! I can't wait to hear all about it! And Pinch Of Yum always has great recipes! Those scallops caught my eye too! A macaron making class sounds like so much fun! I can't wait to hear how it goes. I love that DIY -- so simple and cute. And my husband loooves scallops so I bet he would love that recipe!